Photos of Palestinian life and Israeli occupation in the West Bank city of Hebron. Pictured here: The Israeli border police go on regular patrols in the Old City, even if nothing is happening to warrant such intrusions into the day to day lives of people. Shown here is a group of soldiers on one of their rounds where they stop cars, harass people and shopkeepers, demand IDs and often body search young male adults, hoping to find “something” that will ensure arrest. Members of Christian Peacemaker Teams (CPT) who were there to document human rights abuses indirectly heard soldiers expressing to another group their uneasiness regarding being watched by CPTers. The soldiers angrily said, “They are disturbing our mission” in the area. Despite the veiled threat, CPTers continued to follow the soldiers and observe and document anything that seen as abusive of human dignity. Pictured here: An Israeli soldier kneels in the street and fires a tear gas canister into a nearly empty street. On Friday, for a period of two hours, CPT documented the Israeli military shooting 10 tear gas canisters, fired from the street as well as the rooftops, and 27 sound grenades. These weapons are intended for crowd control, but, on Friday, there were no more than 20 boys present in Bab iZaweyeh. Pictured here: Several Israeli soldiers enter the Palestinian marketplace to secure the area ahead of a group of settlers. On a weekly basis, settlers invade Palestinian neighborhoods accompanied by heavily armed soldiers, disrupting the shopkeepers and visitors. This week, the soldiers created two rings of security around the settlers several dozen meters apart, preventing international observers from watching the group of settlers who are often violent towards Palestinians. Pictured here: Two Israeli soldiers prevent a young girl from entering her home on Shuhada Street because she has a video camera in her hand. Her father had asked her to bring the video camera upstairs because another soldier was in their house detaining her 13-year-old brother for alleged marble throwing. The previous day, the community had proven to the soldiers that it was, in fact, settler children who were throwing marbles at this girl’s house. But, this new battalion alleged that the marbles had been thrown from the rooftop and had hit and injured a soldier in the leg. Pictured here: A 13-year-old boy looks out from the window of a military vehicle after being put under arrest for possessing marbles. 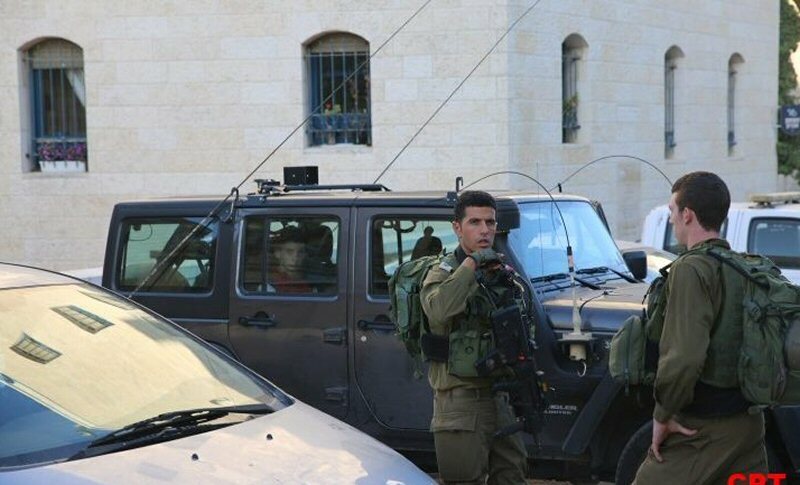 After removing him from his house and dragging him to a secluded place around the corner, the Israeli soldiers then arrested him and took him to the police station for several hours until he was later released. This boy was arrested for allegedly throwing marbles, though multiple Israeli security cameras did not capture any evidence. Settler children who threw marbles the day before were not punished when Israeli soldiers witnessed the event firsthand. 07/07/18 Adalah Mourns Passing of Felicia Langer, 1930 – 2018.